Did You See It On TV? Information about eco and green fashion, such as: natural fabrics and fibers, resale store shopping tips, clothing and accessories from recycled materials, etc. Most closet organizers say, discard anything you haven’t worn in a year. That’s fine for clothes you don’t like. 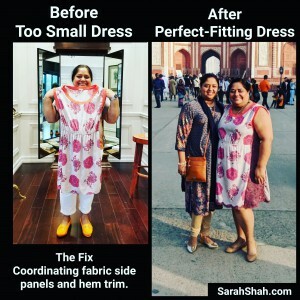 For clothes you love but don’t wear because they don’t fit, aren’t flattering or don’t work in some way, it’s much better to rework them so you love wearing them! Whether it’s just a few tweaks to make a garment fit perfectly or a complete redesign, there are lots of ways to rework your clothes with some creativity and a tailor. If you are at a loss about how to fix your garment, collaborate with your tailor or a creative friend or check out Born Again Vintage for inspiration. Amisha loved this designer dress, but over time it got too small. To rework the dress, we worked with a tailor to add fabric panels to the sides of the dress. We could have chosen a fabric that matched the color and material of the orange trim and created a great new dress. But Amisha has a more eclectic style, so she wanted to do something more creative. She was inspired by the color and design of the purple pattern in the dress. She has a special knack for coordinating prints, textures and colors and found this blackberry lace fabric that was such an unexpected and inspiring choice. It coordinated perfectly with the patterns and colors in the original dress and reflected her design aesthetic. We worked with a master tailor to add side panels to make the dress bigger and create a flattering A-line fit. We also added some of the lace along the hem to create a bohemian scalloped edge design and add little extra length. Voila! A custom piece that reflects her style and fits her figure. Now it’s a closet staple, perfect for parties, brunch or travel! Want more? Click here for some more re-imagined garments and tailor tips. Many people think tailoring is just an added expense. However, when a few tweaks can totally transform an outfit, it’s suddenly worth the money! Image Expert Sarah Shah transforms some closet duds into wardrobe stables.